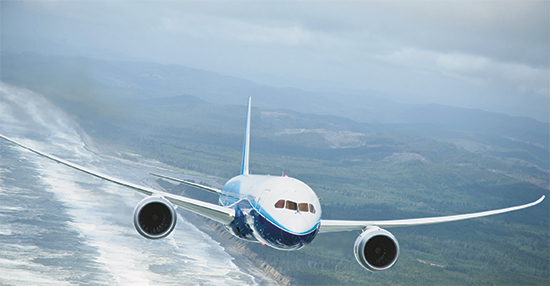 If you’ve flown on a Boeing 787, 747 or 737 lately, you may have seen Arro-Jet Engineering and Consulting’s latest accomplishment. The small waterjet operation, located in Camarillo, CA, has been working almost nonstop for several months cutting dozens of the familiar aluminum covers visible on the Boeing engine’s cowling, known as the leading edge of the fan case. Formed from aluminum and curved for smooth airflow, the leading edge is part of the cowling that directs air into the turbine. 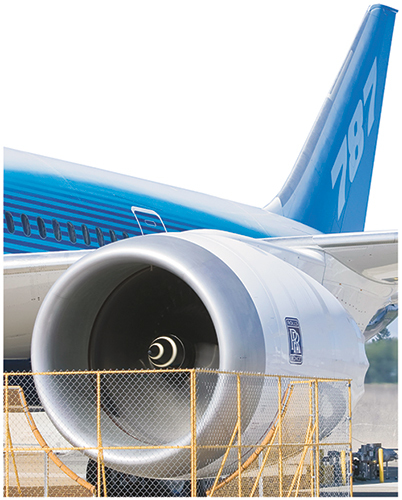 The metallic-colored leading edge on this Boeing 787 jet-engine cowling began as an aluminum plate at Arro-Jet Engineering and Consulting, where the company used a waterjet machine to cut it as two parts then weld it together. Arro-Jet then shipped the ring to Boeing for additional forming. From inside the aircraft, these parts don’t look massive, but stand next to one at Arro-Jet and it towers over you. Arro-Jet cuts the 14 by 14-ft. parts on the largest of its three Jet Edge Waterjet Systems, an 8 by 13-ft. midrail-gantry system. The company produces more than 20 of these components each month from 0.145-, 0.300- and 0.450-in.-thick aluminum plates—parts so large that they are formed in halves and welded in the center. Arro-Jet owner Jose Luis Arce has supplied precise parts to the aerospace industry since launching his own waterjet shop in 2007, after many years as a waterjet operator. The company provides waterjet job-shop work to anyone, but 90 percent of its work supplies aerospace. Arce also cuts a variety of artwork and signs. Testament to his desire for quality craftsmanship, Arce continues to be the exclusive operator of his machines. Arro-Jet can hold a 0.005-in. tolerance with its Jet Edge waterjet-cutting machines, making them ideal for precise aerospace work, according to Arce. Though the cowling-edge parts do not require such tolerances, “the customer wanted to see that the job is good with no defects because the material is expensive,” he explains. Arce cuts the Boeing engine covers at a water pressure of 55,000 psi with a 0.012/0.045-in.-dia. orifice/nozzle combination using 1 lb. of abrasive garnet per minute. 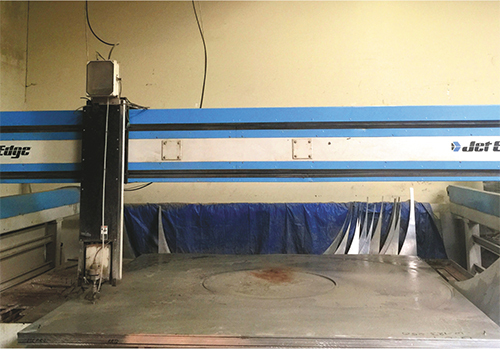 Waterjet is ideal for this application because it leaves a smooth edge that doesn’t need to be ground away, Arce says, adding that the cold-cutting process does not leave a heat-affected zone. After Arce processes the parts, he sends them to Boeing, which forms them into their recognizable curved final shapes. This Boeing cowling piece, at 14 by 14 ft., is hoisted near the 8 by 13-ft. midrail-gantry waterjet-cutting system used to produce it at Arro-Jet. Because the part is so large, it must be welded from two parts to achieve its ring shape. Besides aluminum, Arro-Jet cuts a variety of materials on its waterjets, including stainless steel, copper, titanium, Hastelloy and laminated woods. It can process plates in sizes to 12 by 30 ft. and weighing to 12,000 lb. The machines also cut through steel to 10 in. thick. The waterjet system that Arro-Jet uses to cut the Boeing parts supports multiple cutting heads and can cut complex parts from a range of materials. Its design separates the motion system from the catcher tank, eliminating vibration and ensuring high part quality, according to Jet Edge officials. Arro-Jet specializes in handling complicated jobs that other waterjet shops cannot undertake, according to Arce. The International Traffic in Arms Regulations (ITAR)-certified company benefits from Arce’s mechanical-engineering experience and programming expertise. In addition to his job-shop cutting services, Arce, with his mechanical-engineering degree, also provides engineering consulting services to other waterjet users. His company also specializes in rapid turnarounds. Arro-Jet cuts the Boeing engine pieces at a water pressure of 55,000 psi with a 0.012/0.045-in.-dia. orifice/nozzle combination using 1 lb. of abrasive garnet per minute. 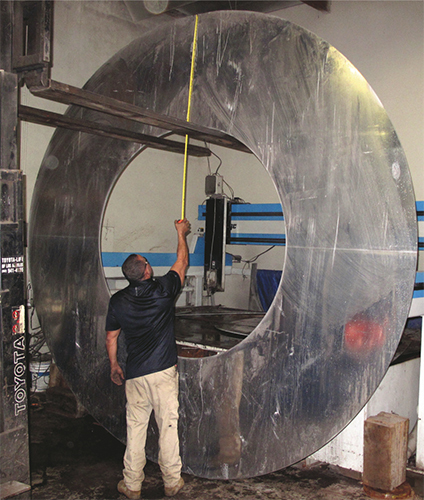 Waterjet is ideal for this application because it leaves a smooth edge that doesn’t need to be ground away, explains company owner Jose Luis Arce, adding that the cold-cutting process does not leave a heat-affected zone. “If they want it tomorrow, they will have it tomorrow,” he says. Key to the three Jet Edge systems employed by Arro-Jet are the abilities to cut with multiple cutting heads and to tightly nest parts. For example, one customer needed parts cut from twenty 84 by 40-in., 3-in.-thick titanium plates valued at $50,000/plate. The customer expected to receive nine parts from each plate, relates Arce, but tight nesting by Arro-Jet produced 10. As a result, the customer received 20 extra parts. Article supplied by Jet Edge, St. Michael, MN; 800/JET-EDGE; www.jetedge.com.